GUN POWDER® is an advanced low calorie pre-exercise supplement containing a specialised formula of caffeine, L-citrulline malate, β-alanine, L-leucine, L-tyrosine, taurine, L-ornithine, L-histidine and L-arginine that enhances exercise performance by working synergistically to improve muscular endurance, maximise energy levels and reduce the feelings of fatigue. Before competition and training, there are ingredients that you can take to boost physiological and metabolic responses during exercise performance. These ingredients include high energy compounds, intracellular buffers and central nervous system stimulants that allow you to perform at a higher intensity for longer during your workout. GUN POWDER® is based on careful consideration of the latest scientific research in terms of positive effects and dose-response for these ingredients. β-Alanine is a non-essential amino acid that can be found in many foods, relatively small amounts are metabolised and transported to the muscle cells. β-Alanine increases the buffering capacity of muscles during high intensity exercise, consequently, fatigue time is delayed and athletes are able to train harder for longer. Using β-Alanine is an excellent strategy for maximising training intensity and improving fitness, speed and strength. L-Citrulline Malate supplementation may improve exercise performance by increasing the delivery of adenosine tri-phosphate (ATP) to working muscles. This can also benefit athletes by reducing feelings of fatigue during exercise and improving the rate of muscle recovery post-exercise. This is suggested to result from increased clearance of ammonia and lactate after exercise which can be detrimental to recovery if levels remain high. Citrulline malate can be particularly beneficial for athletes training hard in preparation for competitive events. Carbohydrate: GUN POWDER® contains 7 g of carbohydrate (CHO) to boost energy levels and facilitate the absorption of nutrients. Adequate energy intake in the form of carbohydrate is important for optimum muscle performance during exercise. Caffeine may spare muscle glycogen (carbohydrate), increase awareness, reduce the perception of exertion, increase resistance to fatigue and improve cognitive function. Caffeine may also provide a vigorous boost to athletes who feel lethargic or fatigued before or during exercise. Arginine AKG: Along with adequate protein and carbohydrate consumption, the intake of arginine has been shown to boost growth after intense resistance training. Nitric Oxide production is another important function offered by the intake of arginine. The production of nitric oxide sends a signal to the inner smooth-muscle cells of artery walls to dilate (relax), resulting in increased blood flow. Enhanced blood flow, particularly during exercise, improves the delivery of oxygen and nutrients to the muscle cells which helps to boost exercise performance. L-Leucine: Leucine is essential for the regulation of muscle protein synthesis and building muscle. Leucine is found in high concentrations in the muscle tissue and helps preserve the breakdown of these tissues during endurance and long duration training. Leucine works synergistically with the other BCAAs to preserve muscle tissue and act as fuel for the body. Tyrosine is a non essential amino acid that is suggested to improve mental alertness and focus which may in turn improve exercise performance. 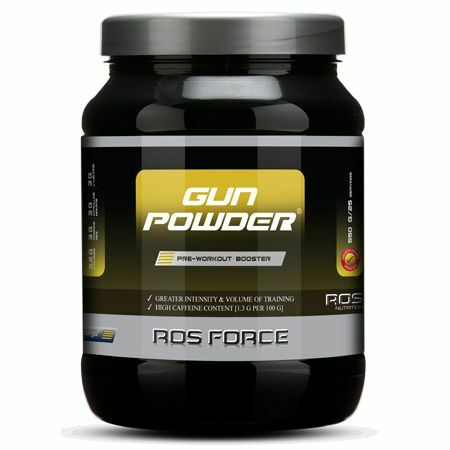 GUN POWDER® is a registered trademark of ROS Nutrition Group Limited. Davis JK and Green JM. Caffeine and anaerobic performance: ergogenic value and mechanisms of action. Sports Med 39: 813-832, 2009. Gun Powder® works best as a pre-exercise drink for maximising energy levels before performance. Take one serving (1 serving = 22 g or 1 scoop) in 150 ml to 200 ml of water 15 to 30 minutes before your training or activity. For recovery we recommend using RecoverAce® Strength or Endurance for optimum recovery depending on the preceding session/activity. For more information, go to RecoverAce® Strength.